Games I illegally unlocked achievements in: Turmoil, Unturned, and Fallout Shelter. I was accused of unlocking achievements in: Sid Meier's Civilization V.
Although the reason that my account was locked was not using software that changes game codes, I still re-locked all achievements from the games that I cheated in, and I have since started to re-earn the achievements. If any reader is wondering, the games were: Turmoil, Unturned, and Fallout Shelter. The game my account WAS locked for was Sid Meier's Civilization V. All the way back in October 5, 2018, there was a glitch in which Steam said I had earned a total of 132 achievements, the achievements were all the achievements I had earned before that day. Attached to this Appeal are three photos, one of all the achievements being earned on the same day, one of an achievement earned three days before the glitch, and one of the same achievement earned three days before the glitch saying it was earned on October 5,2018. Although this may not be a lot of evidence, I hope it is enough evidence to prove my innocence. All achievements being unlocked on October 5, 2018, the day of the glitch. One of my achievements being unlocked on October 2, 2018. The same achievement displaying an unlock date of October 5, 2018, the day of the glitch. Do you have any more details about WHY so many achievements unlocked at the same time/day improperly like that? @Xeinok Unfortunately, I do not know why this happened. I was hoping somebody here would know. I didn't do anything to trigger the event, and if I did, then it was most definitely on accident and unintentional. Internet issues? Does anyone else have access to your account? Did you have any people in your house that day? Any family share happening? @Xeinok At the time of the glitch, nobody else had access to my account. There were people in my house, but I don't believe that they had anything to do with the glitch. Also, sorry for the long respond times, I have been quite busy and had a lot on my plate recently. Do you want to relock and wipe clean these games with the spontaneous/improper unlocks? @Xeinok I have already re-locked all achievements in the games that I had improperly unlocked achievements in. I have since started to earn them back, though. EDIT: Are you referring to Civ V, the game I did not cheat in? I am hoping there is something else I can do that would not result in me having to take down all of my honest work, because I have been playing that game for quite some time, and a lot of work went into that game. 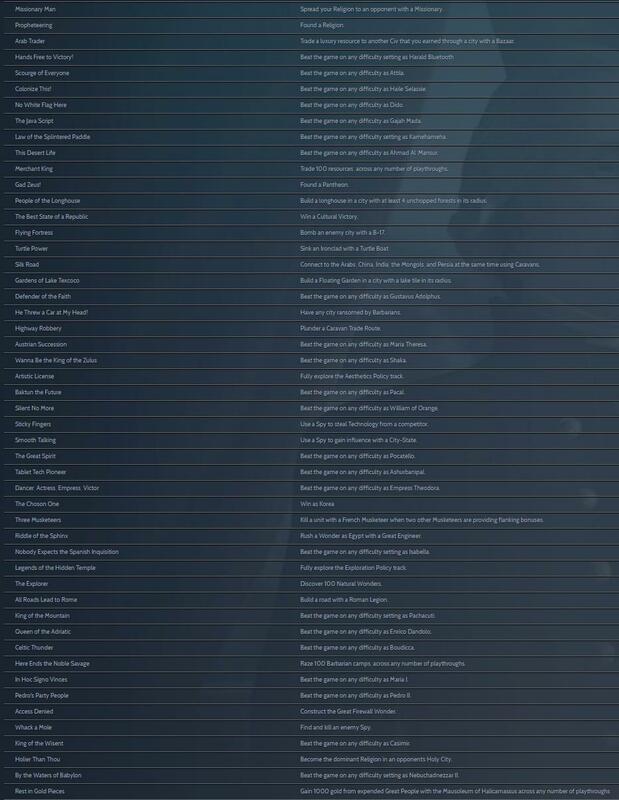 This is every achievement that unlocked at the same time in Civ 5. Do you have any ideas at all? Able to find any other case of this happening to anyone? Did you play any of these civs/etc.? How and why were Turmoil, Unturned, and Fallout Shelter cheated? As for cheating in Turmoil and Fallout Shelter, I used an application that allowed me to change the value of codes, so that I could have more or less money and resources. I mostly did it because I was never in the achievement hunting groups yet and I didn't think of the repercussions. It also just seemed like a fun concept to be able to influence a game in a special unintended way. It was very empowering at the time. As for cheating in Unturned, I used the in-game commands to give me vehicles, guns, ammunition, ect. I did this for the same reason mentioned above. This next list will be a long one, since I have to explain each achievement from that list you mentioned. Missionary Man: All I had to do was start a game, found a religion, and send a missionary to one civ. It takes only like a few minutes in a quick game. Propheteering: See above, found a religion. Arab Trader: Be a civ with a bazaar and make a trade. Just be a Civ that has a Bazaar and go on quick mode. Merchant King: That was just a buildup of trades that I just so happened to achieve on that day. Gad Zeus: Part of founding a religion, see "Missionary Man"
People of the Longhouse: Start a game as someone who can build a longhouse, and just build a longhouse next to a group of trees. Takes only a few minutes in quick mode. Flying Fortress: Just start as a civ with a B-17 and change the starting mode so that you are in an era that has the B-17. You can do that legally through the intended select screen. Turtle Power: Start as a civ with a turtle boat and change the starting mode so that you are in an era that has the Turtle Boat. Make a turtle boat and an Ironclad, and gift the Ironclad to someone else, start a war, and destroy the Ironclad with your Turtle Boat. Silk Road: Create a game with the correct Civs, and just make a few caravans with them. Also, make it a small Pangaea map. Gardens of Lake Texcoco: Be a civ that can build the Floating Gardens, and just spawn by a lake, it takes a few tries to spawn by a lake, but once you do, just build it. He Threw a Cat at my Head: Spawn with Brutal Barbarians (or whatever it is called that makes Barbarians brutal) and just wait for them to attack you. Highway Robbery: See, "Silk Road," all I did was plunder the trade routes once I earned the achievement. Artistic License: Create a game with as advanced as you can, the further you are, the more culture you start with (also all of the cultures will be unlocked). Just spend all of your culture points on the Aesthetics policy. Sticky Fingers: Start a game far enough that there are spies, and then send a spy to a civ with more discovered than you, and let the spy do the rest of the work. Smooth Talking: See above, send a spy to a city state, and let the spy do the rest of the work. Three Musketeers: Be a civ with Musketeers, make three of them, surround them by an enemy, then attack. Only takes a few minutes. Riddle of the Sphinx: Be Egypt, get a great engineer, and rush a city that is building a great wonder with the great engineer. Only takes a few minutes on quick mode. Legends of the Hidden Temple: See, "Artistic License," do the same but with the Exploration Policy Pack. The Explorer: Most likely earned this that day because of how many games I was creating, and that there is always at least one unexplored ruins very close to the spawn point of a player. All Roads Lead to Rome: I believe all I did was go in the, "Fall of Rome Scenario," and build a road with a Legion. Here Ends the Noble Savage: This is another achievement that I was working on for a bit, but was aided by how many games I had started that day. All I did was target Barbarian Encampments with my armies. Access Denied: I don't remember earning this the same day as all of these other achievements, especially because, if one looks at the pictures I have displayed in my original post, you can see I originally earned that achievement on a day when I only earned a total of 3 achievements in Civ V.
Whack a Mole: See, "Sticky Fingers," Everyone else had spies, so all I had to do was put a spy in my capital and wait for the spy to capture another spy. Holier than Thou: Make a 2 player game, quick mode, and then spam missionaries at their holy land. Only takes a few minutes. Rest in Gold Pieces: Build the Mausoleum of Halicarnassus as a civ that earns great people quickly, and just keep using them up. There are a few achievements in that list that I feel like were not earned that day (the underlined achievements), but I still explained them anyways, but only mentioned one in the list because I could prove that one was not earned that day. I hope this post helps in the process of proving my innocence in Civ V and allowing me to be forgiven in the three games I cheated in. Thank you for your time and sorry for the long message.